A neo-Nazi site that disparaged a woman who died during protests in Charlottesville has faced another wave of rejection by web companies. The Daily Stormer's account with Cloudflare - which protects websites from distributed denial of service (DDoS) attacks - has been terminated. Cloudflare's chief executive Matthew Prince said he had "had enough", in a company email obtained by Gizmodo. However, he added that he felt conflicted over the decision. "Literally, I woke up in a bad mood and decided someone shouldn't be allowed on the internet," wrote Mr Prince. "No-one should have that power." On Sunday, the Daily Stormer published an article denigrating Heather Heyer, 32, who was killed after a car rammed into protesters against a far-right rally in Charlottesville, Virginia. This led to a backlash in which the site had to switch domain name registrars twice in 24 hours, after GoDaddy and Google both removed it from their services. Cloudflare's service involves handling web users' requests to view a site and filtering out those that appear to be coming from systems set up to overload the site. Without such protection, websites can sometimes be knocked offline. WATCH: Is there a single step that can bring equality to the US? Mr Prince said leaving the site open to DDoS attacks could lead to "vigilante justice", in a blog post published later on Wednesday. However, he also said: "Our terms of service reserve the right for us to terminate users of our network at our sole discretion. "The tipping point for us making this decision was that the team behind Daily Stormer made the claim that we were secretly supporters of their ideology." Earlier in the week, the Daily Stormer was set up as a site on the dark web and later relocated its open web presence to a Russian domain name ending ".ru". A spokesman for the Russian media watchdog Roskomnadzor said it had asked web firm Ru-Center to shut this down. A BBC check on Thursday morning found that the .ru address no longer appeared to be working. 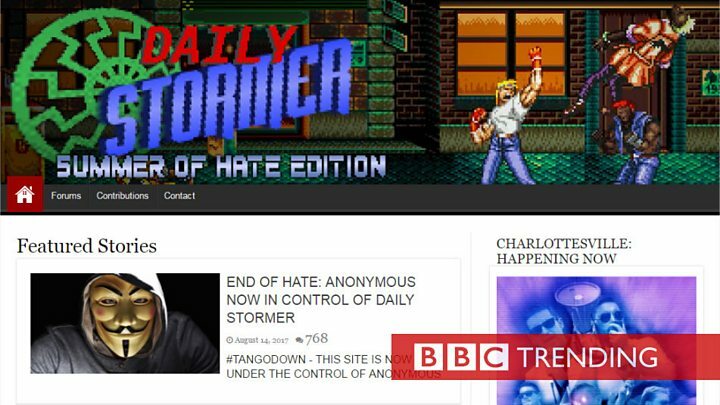 The Daily Stormer has faced frustration elsewhere in recent days. Three Twitter accounts associated with the site that had previously been active were suddenly listed as "suspended" on Wednesday. And cyber-security researcher Joseph Evers announced that he had stopped hosting an internet chat channel he said was used by staff at the Daily Stormer. Describing himself as having once been a "free speech absolutist", Mr Evers added: "I'm glad to do my small part in countering white supremacy." Besides the Daily Stormer's case, this week Paypal reiterated its stance on blocking donations to organisations that promote hate, violence or racial intolerance. "This includes organizations that advocate racist views, such as the KKK, white supremacist groups or Nazi groups," the payment-processing firm said. Internet companies were facing a "dilemma" over how to balance support for freedom of speech with a desire not to encourage hate groups, said Prof Eric Heinze, at Queen Mary, University of London. "Had the Charlottesville events not occurred, the hate sites would still be operating from Cloudflare, GoDaddy, and other such venues," he told the BBC. "Some might call it satisfactory to wait until actual harm occurs before closing such a site. But others will say that's too little and too late."